Perhaps the least important thing about this furious and hilarious bass, drums, and guitar combo (with occasional brass conspirators) is that the electric guitar player is Mary Halvorson. 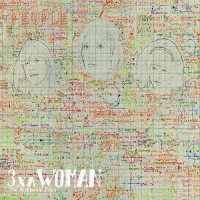 Along with her bandmates, Kevin Shea (Mostly Other People Do the Killing) and Kyle Forester, she has created People, a band that is aware of the line between avant-garde “post”-rock and improvisational jazz, and is keen on obliterating it. Halvorson, of course, is the jazz critics’ current darling guitar player, and she seems keen on releasing as much music in as many band formations as she can. But in People, she takes a back seat to the overall conceptual humor and chaotic noise. Which is not to say she doesn’t make her presence felt. There are quite a few spots throughout the album, especially on the few longer tracks, where things slow down a bit and her non-distorted jazz chords pop up. But mostly she’s content to play what’s needed, and sing the lead vocals. This is not to say the album’s uncomplicated; time signature changes abound, complex vocal harmonies challenge the instrumental passages, and then there are the lyrics, courtesy of drummer Kevin Shea. Lyrically, this album is conceptually self-aware, and precious almost to a fault; its saving grace is that it doesn’t take itself too seriously. In 1977, Peter Blegvad, John Greaves, and Lisa Herman released an album called Kew. Rhone that could be called a precursor to this album, both in terms of its own way of obliterating the line between jazz and rock (rather than submitting to fusion) and self-referentiality. But where Blegvad and Greaves wrote songs whose lyrics described the artwork included on the album sleeve and consisted of anagrams of the album title, People go one step further, and, seemingly impossibly, lyrically dissect the very songs they’re performing. And taking a run at Lionel Richie. While the album, oddly, starts out with a New Orleans-influenced brass-only piece that begins in a funereal tone and ends up as a bright, ecstatic toe-tapper, it then abruptly goes into high-speed car-chase momentum with titles like “These Words Make up the Lyrics of the Song,” “A Song with Melody and Harmony and Words and Rhythm,” and the clincher, “The Lyrics Are Simultaneously About How the Song Starts and What the Song Is About,” in which Halvorson and Shea explain to you what you are hearing and urge you to guess what is about to come next in the song. There are also a few songs that, as the album title suggests, take on the lyrics of a certain Lionel Richie/Commodores song: “What’s So Woman About That Woman,” and “Reinterpreting Confusing Lyrics to Popular Songs.” Unfortunately the lyrics are somewhat hard to make out, but it’s clear that Richie is getting the business for the absurdity of his famous and titular line, “You’re once, twice, three times a lady.” People (the band) make fun of the mathematical implications as well as the problematic gender and sexual overtones. Yes, humor belongs in music. What doesn’t belong is snobbery, and this CD would be a great thing to toss the way of hipsters who have come to disdain jazz and “respectable” journalists for major newspapers who claim that jazz is dead, eviscerated, and irrelevant. This is the new thing.